News & Topics ｜ SEIMITSU SPRING Co.,LTD. I had Tomato Bank hold a business training seminar of manners. There were also many cases that I learn and know for the first time once more about business manners. I utilize the thing learned today for practice so that I'm not embarrassed as a member of society. I called on Mr. Oka Yamatsuji profit Sono and learned how to make tea real green tea. A speciality store of green tea and powdered green tea called on Mr. Oka Yamatsuji profit Sono and learned how to make tea green tea. I had the temperature of the hot water, the amount of the tea-leaf and timing tell me to the small place, and knew the profundity of the tea. 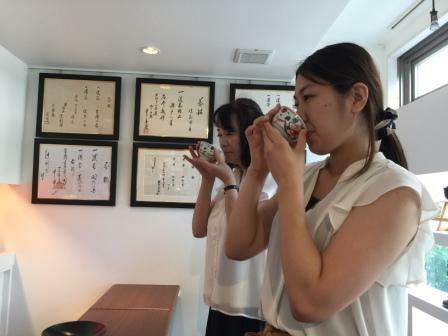 When a customer came to our office using a learned thing, I'd like to offer the good green tea you can appreciate. 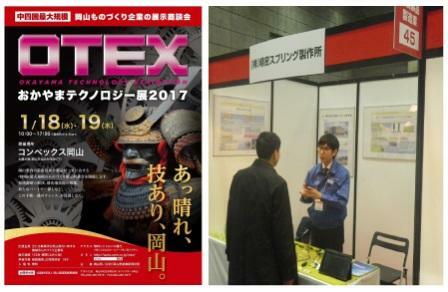 I participated in Okayama-ken industrial promotion foundation sponsorship "Corporation Jatco" exhibition business discussion meeting. 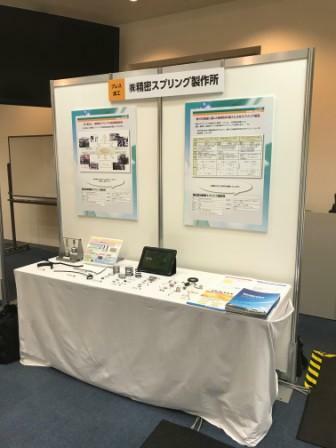 I participated in a "Corporation, Jatco" exhibition business discussion meeting of August 1, 2017-2 days and Okayama-ken industrial promotion foundation sponsorship and introduced our possession technology. 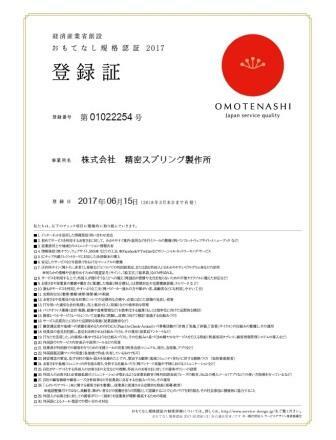 I registered with "the Ministry of Economy, Trade and Industry, foundation Hospitality standard authentication, 2017", and it was approved. I'd like to offer the service which can have a customer meet the heart you're treating as an industry importantly. I advance more internal improvement to express the thought that you're entertaining in the visible shape. 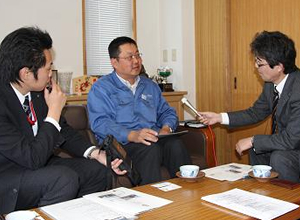 I had the Okayama Harada steel pipe Corporation and Shikoku Maruichi Steel Tube Ltd. hold a study meeting of the pipe material. 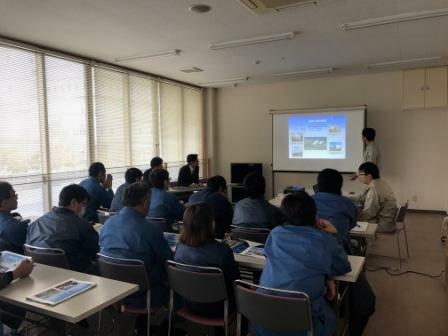 Knowledge of the pipe material was deepened for the Okayama Harada steel pipe Corporation and Shikoku Maruichi Steel Tube Ltd., and you held a study meeting in order to choose the most suitable proposition of data and processing method. Thank you very much for your guidance to which kindness is polite. A cogon, oh, technology exhibition I participated in 2017. A cogon, oh, I participated in a technology exhibition and introduced our goods and possession technology. 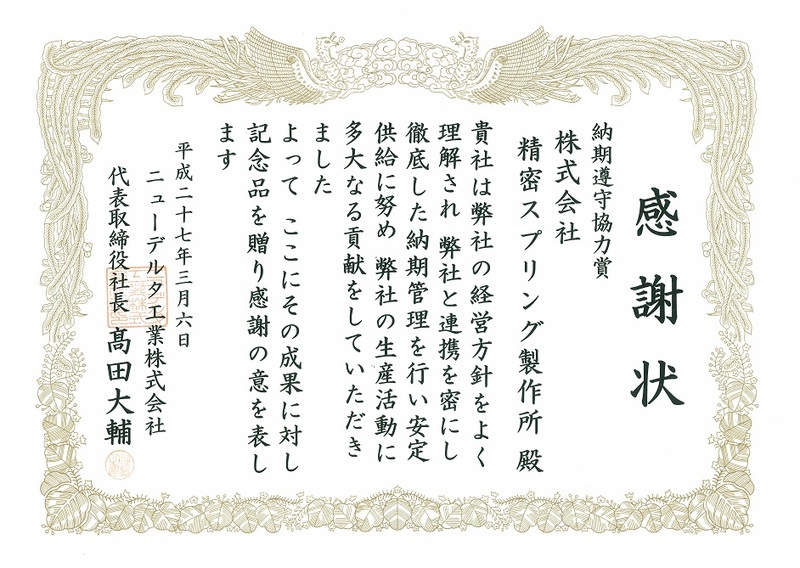 I received quality commendation from OG Giken Corporation. 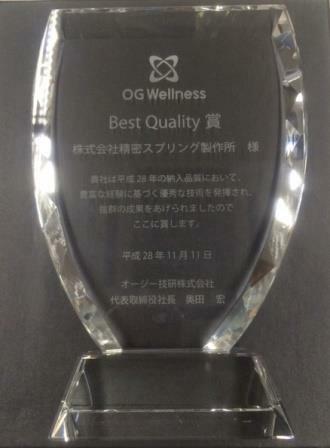 I received Best Quality prize in a OG Giken Corporation quality promotion meeting. It'll be the whole company cluster and be the whole company cluster in quality improvement, and I work on quality improvement in order also to receive such prize from now on. The third sectional campaign of a cooperation enterprise meeting of YANMER Corporation (seieikai) was held in us. I explained our match with the theme of the upbringing of human resources and did a valuable exchange of views. YANMER Corporation Morimoto executive director came to our office. It's growing in order to be the best partner of YANMER Corporation. We got a letter of thanks from Sanyou equipment Corporation. 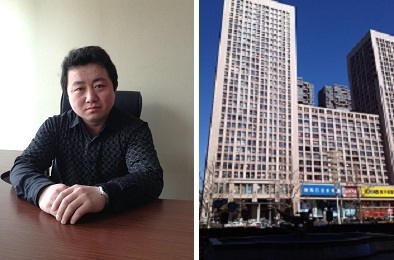 We exert ourselves so that it'll be also a trusted cooperation company now. I confided Kumamoto earthquake contribution to Sanyo Shinbun. 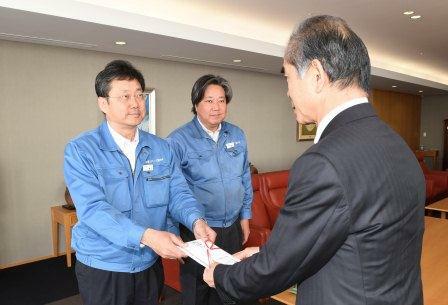 The environment that our industry is surrounded was the situation that severity is increased, but I thought when it's help of everybody hit by the earthquake disaster with which this Kyushu was seized and took a contribution to Sanyo Shinbun. One day of everybody who suffered will wish for rest in peace of the person who died of an earthquake disaster as well as also wishes for early rehabilitation. We had them hold an educational seminar from Tomato Bank. We had cooperation of Tomato Bank hold a seminar "about communication". It was authorized by a quality control excellent authorization factory from YANMER Corporation. We had guide in an idea of "3S3 fixed campaign", and the whole company wrestled in a body. As a result, I'm thankful that you could authorize and work on further improvement. 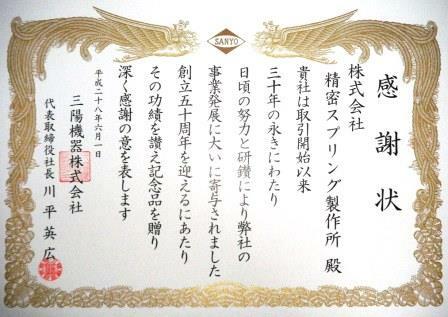 Our company received a thankful certificate paper about management in a delivery day from New Delta Industrial Co.,LTD. 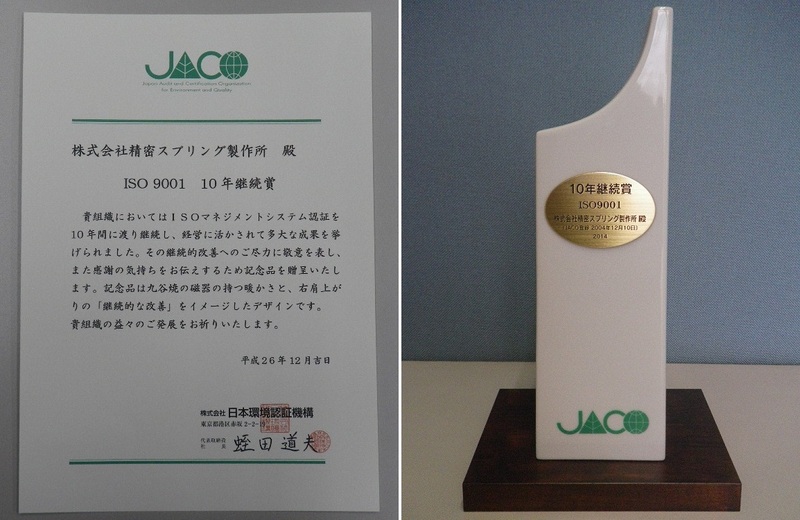 Our company received official commendation of 10 year continuation of ISO from JACO. Our company received an excellent prize about improvement activity in fiscal year 2013 from EAGLE INDUSTRY CO., LTD..
Our company received an excellent prize about improvement activity in fiscal year 2013 from EAGLE INDUSTRY CO., LTD..I received an award for effort in 2010 and 2012, and also commended this year. 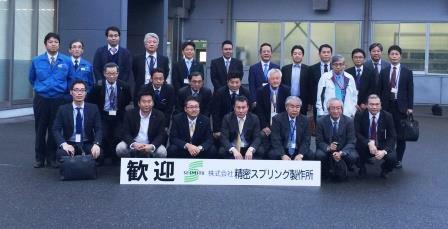 We participated in Nissan exhibition business talk meeting. 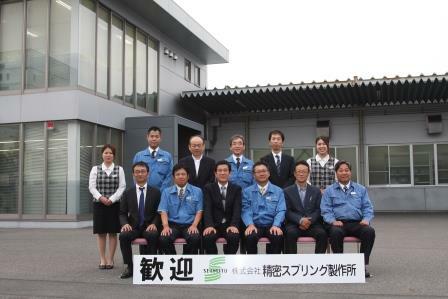 On May 16, 2013,We participated in Nissan exhibition business talk meeting which "Okayama Prefecture Industrial Promotion Foundation"　sponsors, and introduced our possession technology. Our company received the prize for effort about the quality assurance plan in the 2012 fiscal year from EAGLE INDUSTRY CO., LTD..
On March 25, 2013, our company established the trading company to Dalian. We participated in Honda Motor Co.,Ltd. exhibition business talk meeting. On July 24, 2012,We participated in Honda Motor Co.,Ltd. exhibition business talk meeting which "Okayama Prefecture Industrial Promotion Foundation"　sponsors, and introduced our possession technology. 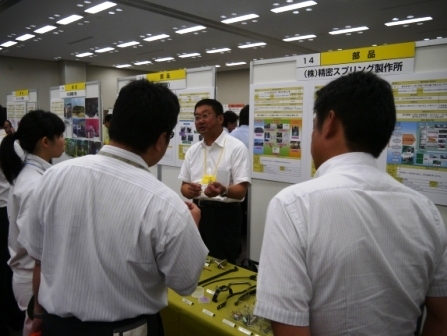 We participated in Fuji Heavy Industries exhibition business talk meeting. 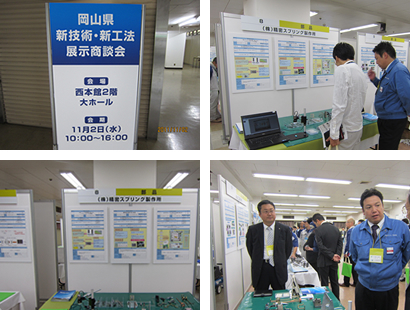 On November 2, 2011,We participated in Fuji Heavy Industries Ltd. exhibition business talk meeting which "Okayama Prefecture Industrial Promotion Foundation"　sponsors, and introduced our possession technology. "RSK Sanyo Broadcasting Radio" came for coverage. March 31, 2011,　"RSK Sanyo Broadcasting Radio" came for coverage of "Okayama company selection 2011 ～Look for dream makar～". An introduction page is here. 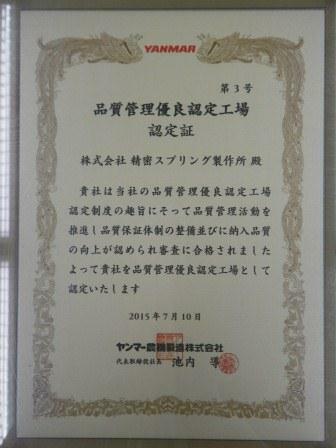 Our company remitted support money to the disaster victims of the Great East Japan Earthquake. 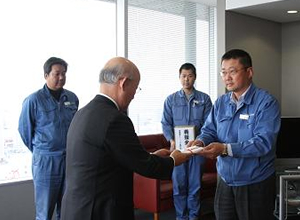 Our company thought that it would like to do something for the disaster victim of the Great East Japan Earthquake. Therefore, we collected and remitted the fund raising in the company. All employees are praying that more people are saved. Seirei Industry Co., Ltd. of the Yanmer group authorized our company to "Quality control superior authorization factory ". 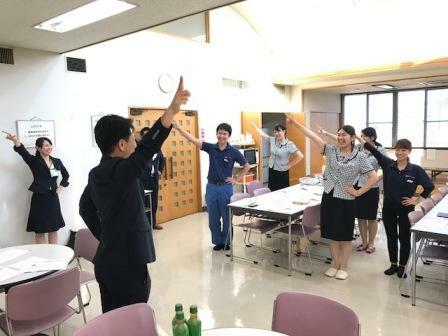 All the employees did [All points・All the processes・The self-process check of all the numbers], being taught by the visitor.